The Xperia Z4 Tablet is a hugely promising premium offering on the full-size tablet market. Perhaps a touch too premium, but we'll see if it succeeds to justify its price tag. It is, after all, the only mainstream tablet out there to boast IP68 certification and manages to do it in a super-slim and lightweight body. And that's one of the major question marks hanging above it - will battery life be good enough, or has the push for compactness meant a sacrifice in autonomy? We'll find out on the following pages, but first things first - we kick off with design and hardware overview. Disclaimer: This review is based in a pre-production Xperia Z4 Tablet LTE unit, running the latest available firmware version, as indicated by the device itself. Hence it's possible that parts of our test observations may not reflect the performance and qualities of the retail product. We'll update the test findings as soon as a retail unit becomes available to us. Sony came up with the company's current design aesthetic a while back and closely sticks to it with the Xperia Z4 Tablet. It's dubbed OmniBalance and its roots could be traced to the original Xperia Z smartphone introduced more than two years ago. Now there surely will be those that insist that it's a long time for a design to remain unchanged in today's fast moving world. While there's some truth to that, there's no denying that the Xperia Z4 tablet is a looker of a slate. 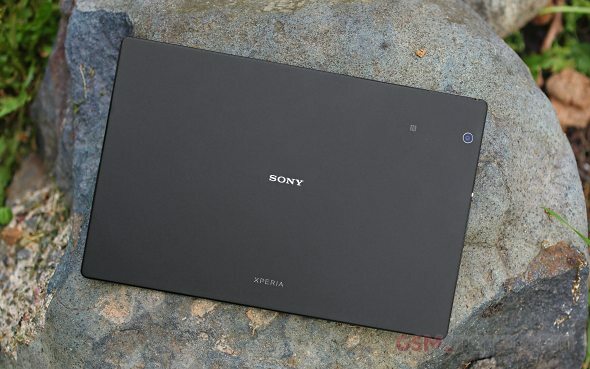 It is more or less the Xperia Z2 tablet with a few minor tweaks. The front is glass as usual, but the bezels have been trimmed down and the tablet has lost 12mm on the long side and 5mm on the short. Notable differences and ones that are readily noticeable in reality. There's a Sony logo in the top left corner, the 5MP front camera is right in the middle joined by an ambient light sensor, and the notification LED is the top right corner. On the front, towards the edges of the short sides, you can find the thin slits, where the stereo speakers reside. A welcome design move sees the speakers positioned some 3cm higher than in the previous generation, where they were easily muffled. Only it would have been nicer if they were even further up, perhaps somewhere in the top third, because as it stands, there are still cases when you put your palms right on top of them. The back borrows its design prom the predecessor too. Sony adopted matte plastic for the tablet lineup as opposed to the glass on the smartphones, deeming it much too hard work to keep all that vast shiny surface clean. Indeed, the soft plastic looks good and is less prone to accumulating fingerprints, but it's not all that easy to clean once it does get dirty. We're not sure how the white model will fare in this respect. Sony has gone quite minimalistic with the back. There's a small company badge dead center and an even less conspicuous Xperia inscription below. The main camera lens sits in the top right corner and the position of the NFC antenna is marked with a tiny logo, relocated compared to last year. Sony has gotten rid of the regulatory markings and stuffed them in a tiny label inside the slot compartment, like it did on the Z3 Tablet Compact. The left side is home to the power button and volume rocker, both in a very natural position for your left thumb when holding the device in landscape orientation. On the right you'll find a lone microUSB 2.0 port, which now has no flap. The top left corner (when viewed from the front) is where the 3.5mm headphone jack is located, moved from the bottom left, where it would have interfered with the optional keyboard dock, but more on that later. To the right of the jack is the slot compartment. Behind a flap, meant to provide the IP68 sealing, you'll find the nano SIM and microSD slots. The single mic is further towards the center. The bottom is completely bare. The Xperia Z4 Tablet is nothing short of impressive when it comes to thickness and weight. The 6.1mm profile, coupled with less than 400g of heft mean that Sony's offering is as close to comfortable single-handed use as we've ever seen from a 10.1-inch slate. Longer reading in portrait is not a problem, though in landscape the center of gravity is further away and thus puts more strain on your wrist. With both hands weight becomes a non-issue. In landscape, however, there are cases when you could end up muffling the speakers, unless you're careful to keep them in between the bases and the tips of your thumbs. Or you could rotate the whole device upside down and forget about it. The bezels are adequately sized, so that you have enough area to establish a secure grip, without being unnecessarily large. The back surface is grippy enough as well. Alongside the Xperia Z4 Tablet Sony announced the BKB50 snap-on keyboard dock which turns the tablet into a compact Android netbook. The keyboard weighs 365g and thus the pair totals around 760g and 13mm. At the hinge it's slightly thicker, obviously. Sony claims you can get a month and a half of battery life out of the keyboard's 400mAh cell when used for 8 hours a day, but we had no practical way of confirming it. The tablet fits securely in a cradle, which is hinged to the main body of the keyboard. The hinge is quite tough to turn without a tablet inside, but that's not how it's meant to be used and with the Z4 Tablet attached, the force required is just right. The entire assembly clicks positively in the closed position and offers up to 130Â° tilt angle when fully open. The keyboard communicates with the tablet via Bluetooth and the initial pairing can be done via or manually in the Bluetooth settings of the tablet. The keyboard apparently has a sensor in the hinge, which sends the tablet to sleep when closed, and wakes it up when opened. The BKB50 has a full QWERTY layout with a number row and function key row. The key spacing is roughly 16mm, as opposed to the 19mm of the regular full-sized keyboard but it's still comfortable to use and there's no room for comparison to an onscreen keyboard. You also get keys that double the onscreen Back/Home/Task buttons. It's a chicklet-style keyboard and the keys have adequate travel and offer positive feedback. There's also a nice touchpad with button areas on the bottom, but not actual discrete buttons. It is a preproduction unit we have on our hands, so additional tweaks may be made before the official release, affecting battery life. Our curiosity got the better of us though, and we ran a few tests to see how the device fares in this regard at this point in its development. Nothing's official, but we got about 14 and a half hours of video playback and 12 hours of web browsing time, both remarkable achievements. If you have the Wi-Fi only version and an Xperia _phone_ with a data plan, you can use Xperia Link to share the phone's internet connection over Bluetooth (which uses less power than a Wi-Fi hotspot). MicroUSB handles charging and PC connectivity. Interestingly enough there's no USB On-the-go support mentioned in the specs and neither did the functionality work on our unit, regardless of whether we tried USB flash drives, mice or keyboards. That may have something to do with the fact that it's a pre-production sample, or Sony may have stripped the functionality altogether. The port is MHL-enabled though, and supports HDMI connections to an external monitor. 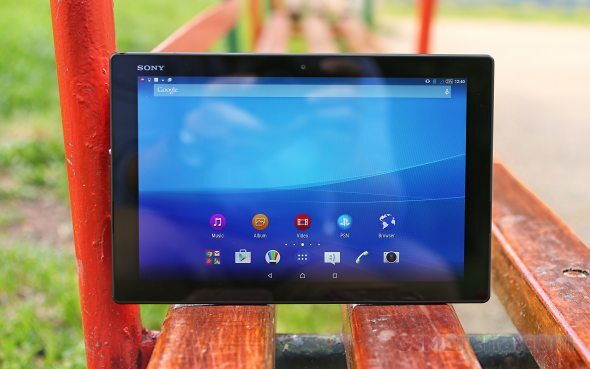 The Sony Xperia Z4 Tablet runs on Android 5.0, and that makes it one of the first Sony devices we encounter to boot Lollipop out of the box. Sony's customizations are on board as well, but they are ever so mild and the company's overlay is among the lightest around. The lockscreen shows a single clock widget, with a choice of two digital faces and a single analog one, and there's also a camera and a dialer shortcut. The lockscreen notifications brought with Android 5.0 are here as well. Sony has enabled double tap to wake, but sending the tablet back to sleep requires pressing the power button. The homescreen is the familiar shortcuts and widgets affair, but unlike the Z2 Tablet there is now a dock, and unlike the Z3 Tablet Compact it moves to the bottom of the screen when you switch from portrait to landscape orientation. As usual, Sony offers Themes, which change the wallpaper and some of the system colors. There are several themes preloaded (plenty of wallpapers too) and you can get more online, both free and paid. The notification shade is the stock Lollipop flavor, with quick settings toggles and a brightness slider, but no auto brightness switch readily available. The shade slides down in the middle of the screen and a two-finger swipe results in direct access to the toggles, while single-finger pull brings down the notifications. You can rearrange, hide and add toggles, with Wi-Fi and Bluetooth always visible. Tapping the icon works as an on/off switch, while tapping the text below takes you to the relevant section in the settings menu. The app drawer is laid out across multiple pages and you can sort the apps manually, alphabetically, or by the most used. The menu with those settings is accessible via a swipe from the left edge of the screen, which is the way Sony does things across its interface for a welcome consistency. You can also search and even uninstall apps from there. The Xperia Z4 Tablet uses a standard-issue app switcher with the Lollipop rolodex look and a Close all button. There's a twist though and it comes from Sony's Small Apps. They pop up tiny widget-like applications on your homescreen, which you can move around and use without having to open the full-fledged app. There's a default set of nine: Active Clip, Chrome Bookmarks, Browser, Calculator, Calendar, Gmail, Google Keep, Timer, and Touch Block. You can download more Small Apps off the Play Store or use the option to turn your favorite widgets into Small Apps. Just hit the Plus key at the top of the list and choose a widget. You can launch only one instance of a Small App, but you can open multiple Small Apps simultaneously. The small apps do offer added functionality, but the large 10.1-inch screen as well as the powerful hardware can handle more extensive multi-window multitasking features. With the tablet's business orientation, underlined by the available dock keyboard, those would have been more than welcome. The Sony Xperia Z4 Tablet is powered by the Qualcomm Snapdragon 810 chipset, and enough has been written about it to revisit it all again. What could potentially work in its favor in this case is the sheer area that the designers have for heat dissipation, though with the plastic back and limited thickness you can't really engage the entire surface. What also needs to be pointed out again is that the review unit we have for testing is a preproduction prototype, so it may not be entirely representative of the performance of future commercially available models. The prototype status of the device is likely the reason why most benchmarks we installed were rejected by the device and immediately uninstalled. We still managed to run a few tests, and the results can be found below. We threw in the comparison the HTC One M9 and the Samsung Galaxy S6. Obviously, the flagship phones have little to do with the Xperia Z4 Tablet in terms of form factor. However, the Galaxy S6 can provide a good comparison of the S810 versus the Exynos 7420 when both have to deal with QHD resolution (OK, WQXGA versus QHD, but still close enough). Meanwhile the One M9 is the latest device we had with the same S810, so it should be an indication of how things stack up between brothers. There hasn't been an S810-powered device above FullHD resolution in the office before the Xperia Z4 Tablet, so that's the next best thing. Out of the compound benchmarks we managed to run only Basemark OS II, and the Z4 Tablet really has nothing to hide. The overall score is easily the highest among competing tablets, including the iPad Air 2 and the Nexus 9, but it also beats the Galaxy S6. 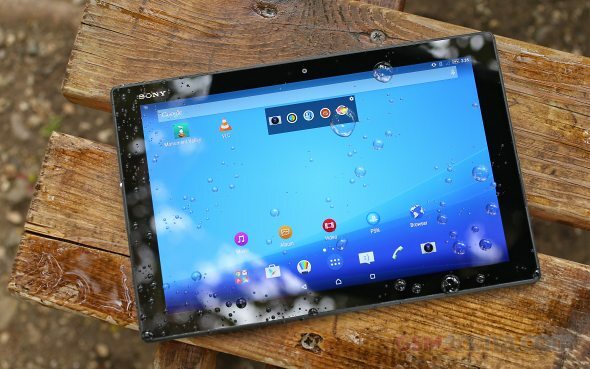 The Sony tablet pulls ahead from a worse starting position. Graphics performance turned out solid, as well. 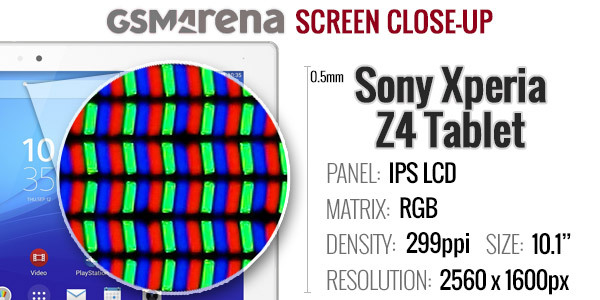 The offscreen scores (rendered at 1080p resolution) put the Xperia Z4 towards the top of the bunch, though the iPad Air 2 is significantly ahead in the lighter T-Rex routine. Moving to onscreen results (at the respective device's actual screen resolution) the Z4 Tablet still lags behind the iPad Air 2 and the Nexus 9, but those have a 2,048 x 1,532 pixel resolution which is only 77% of the Z4 Tablet's pixels. The Sony Tablet actually manages to beat the Galaxy S6 in the more intense Manhattan test. Basemark X paints a similar picture with the iPad Air 2 on top, followed closely by the Nexus 9. This time though the Galaxy S6 is in front of the Xperia Z4 Tablet. Again, all these numbers were posted by a preproduction prototype unit. While the tablet is very close to launch and it's running the latest available firmware, the final release may introduce changes in the device's performance. The scores shown here are preliminary and can be taken as nothing more than a hint of what commercially available units may be capable of. The Contacts app makes one issue of the Sony Xperia Z4 Tablet interface rather apparent - the inefficient use of screen estate. Having a simple list of contacts laid out on the entire 10.1-inch screen really makes no sense. In this respect the predecessor with its split-screen interface looks much more reasonable. The contact list can be sorted by either first or last name and filters can be applied to display only select contacts. There are two search options - a dedicated search field at the top of the contact list, and an alphabetical scroll bar to jump to names starting with a specific letter on the left. To access the search you need to tap on the magnifying glass icon in the top right corner, and then type in the field that pops up in the top left - as if there isn't enough room for a search box to be displayed at all times. We're willing to look the other way in this case, because a 10-inch slate is extremely unlikely to be extensively used for voice calls. Each contact can have a variety of fields (and repeat fields of the same type). There's an Add field button and the X button lets you remove fields as needed. The fields cover anything from names to addresses, nicknames and notes. The Sony Xperia Z4 Tablet features two loudspeakers on the front, flanking the screen. There are a bunch of Sony audio enhancements, namely Clear Audio+, Clear Bass and S-Force surround sound. There is also a 5-band equalizer with presets and two empty slots where you can save your custom curves. The Xperia Z4 Tablet posted a Good score - a marked improvement over the Below Average of both the Z2 Tablet and Z3 Tablet Compact. Apparently there was a solution to work around the waterproofing and it just took Sony some time to find it. Mind you, the scores were posted with all sound enhancements turned off, and pumping up the gain slider in the equalizer should bring the numbers further up. The Sony Xperia Z4 Tablet comes with Sony's proprietary messaging app, as well as Google Hangouts to handle your instant messaging needs. The good thing about it is that you can chat with Hangouts users right inside Gmail or with a Chrome plugin. You can chat with multiple people and even do video calls. Again, both apps stretch over the entirety of the display, with no split screen view. Sony had made the right choices with the Z2 Tablet in this area, but oddly chose not to carry them over to the sequel. There's a Sony-styled generic Email app which can handle POP and IMAP, do batch operations and offers a Combined inbox for all your email accounts. Gmail is also on board and since it gained support for third party servers, it's our email client of choice. We should point out that at least these two apps do provide a split-screen view, with as much as three panes in Gmail's case. As for text input, the Xperia Z4 Tablet offers an on-screen full QWERTY keyboard with multiple customization options. It has three skins preinstalled and three different view modes - big, small and split keyboard. The last two float above the app and can be moved around. Additional options allow you to add/remove the coma and period button, the smiley and voice input buttons and also enable things like bilingual word suggestions if you have more than one language enabled. There's an optional number row, as well as secondary symbols upon press and hold. If you're going to enable auto correction, you might want to let the keyboard learn your writing style by reading your Gmail, Facebook, Twitter or messages you've sent (each of these can be used individually). As mentioned in the hardware section Sony has designed the BKB50 Bluetooth keyboard to be used with the Z4 Tablet for added productivity. When attached, a small task bar shows up on the bottom of the screen which has a Windows-like air to it complete with what looks like a Start menu. The Sony Xperia Z4 Tablet comes with the custom Sony gallery, called Album. Images are organized into groups of thumbnails and sorted by date. You can resize the image thumbnails with a pinch gesture all the way from a grid of tiny, tiny thumbnails to a single image view. The gallery can pull images from your Facebook, Picasa or Flickr accounts for easy viewing in one spot. Alternatively, you can turn the Z4 Tablet into a DLNA server and view photos from the device on a computer or compatible TV. Also here are some special albums - Places, which uses the geotagging info to sort photos by where they were taken, and Faces, which groups photos by the faces of the people in them. The good news is that Sony has fixed up its codec support and the Xperia Z4 Tablet plays just about everything - AVI (DivX, XviD), MP4 and even MKV and MOV. WMV files refused to play. DTS, DD and AC3 audio are not supported and that makes the videos that contain them unplayable, though you can see the picture moving underneath the error popup. The video player does support fully-customizable subtitles. The Sony Xperia Z4 Tablet features an FM Radio aboard, complete with RDS support. The app has multiple skins and integrates with TrackID to recognize the currently playing song. You can even directly send an "I'm listening to..." post to Facebook. The Sony Xperia Z4 Tablet did pretty well in our audio quality test. The active external amplifier trial ended with excellent scores and average loudness. We're used to seeing louder in tablets, but it's still a solid showing. 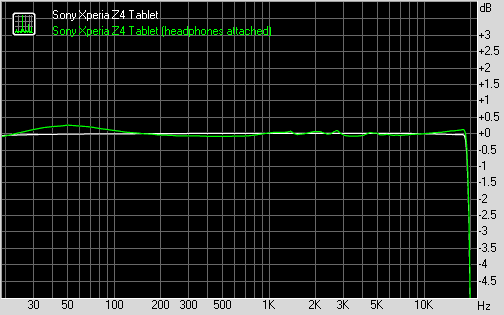 Plugging in a pair of headphones brought some extra stereo crosstalk and a tiny bit of extra distortion, but the overall performance remained solid and it will take a very pretentious audiophile to find something wrong with it. The Sony Xperia Z4 Tablet uses an 8.1MP Exmor RS backside illuminated sensor, which produces images of up to 3,264 x 2,448 pixel resolution. The front-facing camera has an Exmor RS sensor too, though that one is only 5.1MP. The camera interface is identical to that of Xperia phones, as well as tablets and the feature set is almost the same too. The UI is essentially arranged in two viewfinder columns. The right one holds four virtual buttons: a shortcut to the gallery, a shutter key and camcorder button, and a shooting mode switch. Depending on the shooting mode you're in, the video shutter key may be replaced by a still/video mode toggle. The column on the left changes more substantially. In Manual mode you also get a "manual controls" shortcut here, which only offers an exposure compensation slider and a white balance selector. ISO and metering can be adjusted from the settings menu. There's a scene mode shortcut or you can let Superior Auto guess the scene automatically. Proper color saturation, contrast, metering mode along with other settings are selected for you. The Sony Xperia Z4 Tablet camera offers a plethora of built-in features starting from the basics - geotagging, touch capture, face detection, smile shutter, burst shot mode and sweep panorama. We shot our usual test shots, and you can see the results below. We'll reserve judgement, because our review unit is a preproduction model and hence its output may differ from the final version, which people will be able to buy. Sony typically provides a Superior Auto mode, which on other devices produces photos with lower resolution, than available in Manual mode. Here however, the resulting images come out at the full 8MP. You can compare the two below. As is the norm, the Xperia Z4 Tablet has an HDR mode as well. You can also find a sample shot of our mouse, taken with the front camera, to get an idea of its selfie-shooting capabilities. The Sony Xperia Z4 Tablet is capable of capturing 1080p video at 30fps and that's about it. The camcorder app UI is practically the same as the still camera's. You can set a timer and fiddle with settings like exposure, metering, focus mode, etc. For videos the Z4 Tablet features a proprietary SteadyShot digital image stabilization, but there's a price to pay - the field of view (FoV) is reduced (it's how digital stabilization works). The device is smart enough to detect whether you are shooting hand-held or you have rested it on something stable but you get the reduced FoV either way. If you go into video mode from the Manual shooting mode, you get an actual HDR setting and scenes. You can also snap stills during video recording but that's not of much use as you only get 1080p images, you might as well grab a frame from the video. Also note that the image processing is different than still shots. Alternatively, you can go ahead and download an unedited 1080p@30fps video (00:17min, 35MB) straight from the camera. The Sony Xperia Z4 Tablet comes with a pair of browsers, the stock Browser app and Google Chrome. They offer largely the same functionality and the choice comes down to personal preference. With Chrome's seamless integration with other devices it's typically our favorite, plus it has a Data Saver feature, that should cuts down on your cellular traffic. The Sony Xperia Z4 Tablet comes with the Microsoft Office for Android tablet including Word, Excel, PowerPoint, OneNote and OneDrive. The app suite provides as much functionality as you are ever likely to need. The calendar is the same app, familiar from the Z2 Tablet and Z3 Tablet Compact. Entering a new event is quick and easy, and you can also set an alarm to act as a reminder. The Calendar also pulls info on upcoming events from your Facebook account. The calendar can also display the national holidays for a long list of countries and your contacts' birthdays too, and shows the weather forecast for each day. The Alarm & clock app supports multiple alarms, each with its own sound and repeat pattern. You can also set whether the side buttons would snooze the alarm, dismiss it or do nothing. There's also a desk clock option and a world clock (which shows the weather forecast for each city, not just the time). Sony's own Socialife News is a news reader that pulls headlines from web sites and RSS feeds. If you sign into Facebook, Twitter and YouTube, the app will include updates from those services as well. The app repackages the article in an easy to read format with selectable font sizes to make reading a breeze. Sketch is pretty simple to use - you can select the color of the note/sketch and just start typing or doodling. You can customize a wide variety of drawing modes, backgrounds, and stencils. You can use the app to draw a sketch to send with the Messaging app and there's even Evernote integration. There is a nicely touch-optimized calculator aboard. The buttons are really big, too big, and it also offers advanced functions (trigonometry, logarithms), although a lot more could have been fitted. The Power Saver helps you extend your battery life by toggling things like Wi-Fi, GPS, Bluetooth screen brightness, auto sync and background data on and off automatically when the battery charge falls below a certain user-defined threshold. You can also turn off the Wi-Fi if there is no saved Wi-Fi network in range or turn off mobile data when the screen is off, and more. What about Stamina mode? There's a Backup & Restore feature on the Xperia Z4 Tablet, but it's limited to contacts, conversations, calendar entries, call log and bookmarks. The app can't backup multimedia content or documents, something which may be important, given the tablet's work aspirations. Lifelog tracks a host of daily activities, including walking, running and sleeping, but also the music you listen and the photos you take. It then presents the info in a splitscreen view with a timeline on top and detailed numbers on the bottom. The Xperia Lounge app promises to deliver exclusive multimedia content (music, film and sports), promotions and games. It behaves differently in portrait, where you get a scrollable list of video stories, while in landscape the stories are screen-sized. While Sony is busy figuring out what to do with its flagship _phone_ line, the Xperia Z4 Tablet manages to make a compelling case for the entire Z-series. It obviously won't get as much exposure, or generate the same sales numbers as a top-end smartphone, but shows that Sony is still capable of putting together a proficient smart device. For starters, the tablet impresses with its slim profile. At 6.1mm it's currently tied at the top of the thinness chart, together with the iPad Air 2. More impressively though, the Sony tablet easily wins the weight competition, which is arguably what matters more in daily use. Bezels are just the right size for a comfortable grip, without being excessively large. That, combined with the materials used, adds up to a successful design that looks stylish and handles well. And let's not forget the IP68 rating for peace of mind in less than ideal weather conditions. The 10.1-inch display is plenty bright and has good viewing angles, though contrast does suffer when viewed from the side. Resolution is much better than the predecessor and everything is perfectly sharp. The screen is a fingerprint nightmare though, but keeping a 10-inch slate clean was never going to be easy. Battery life is excellent too even on our yet-to-be-finalized unit. Video playback may not reach the advertised 17 hours in our standardized test, but 14 and half hours is still a number worthy of admiration. When browsing the web, the Xperia Z4 Tablet will last you a full 12 hours, also a great result. Android purists will find a lot to like in the Xperia UI, as Sony has, in typical company fashion, stayed close to stock Android Lollipop, with a few proprietary apps on top. There are however some questionable decisions in terms of screen area utilization, with some apps wasting the 10.1-inch diagonal. Perhaps a little work needs to be done for better multi-window implementation, too. The small apps are a good compromise on a smaller smartphone screen, but on a large tablet with aspirations for serious work use, they just fall short. The Sony Xperia Z4 Tablet doesn't disappoint in raw performance either, at least what we could measure from it. The prototype unit we had for testing only ran a few of our benchmarks, but posted solid scores in the ones it did. We'll wait to receive a working unit to run the full set of tests, but the numbers look promising at this point. The tablet comes with an attractive multimedia package. The gallery is rich in features, the Music app has carried the abundant Walkman functionality, if not the badge, and the Movies video player has extensive codec and subtitle support. There's a capable document editor on board too, as there should be, given the tablet's business orientation. Speaking of work, the optional BKB50 Bluetooth keyboard dock does wonders in boosting productivity while maintaining a slim profile. You get to have a tablet for fun and an ultrabook for work, all in the same device. Then there's the matter of price. The Xperia Z4 Tablet is certainly not for those on a tight budget, currently listed for pre-order at £499 in the United Kingdom or 579 elsewhere, which is not exactly affordable. The keyboard dock comes extra, but it's yet unclear just how much. Flagships were never meant to offer the best value for money though and the Sony Xperia Z4 Tablet put up a convincing performance in its attempt to be the most capable slate in the market. We'll need to get our hands on a retail unit to do some more testing, but even at this early stage it's clearly a comprehensive offering, if you're on the lookout for a 10-inch slate.